There are many delicious dishes boosted with the addition of coffee. From cookies to chilis to barbecue, coffee is a bonafide staple outside of its drinking applications. Since the mid-1600s, coffee has been a custom for Europeans, but for years prior, it was widely consumed in the Middle East and the Turkish Ottoman Empire, and before that, from its purported birthplace in Ethiopia. Today, of course, coffee is the global morning beverage. There are other varieties of coffee besides the arabica we’re used to drinking—like robusta, which is higher in caffeine and lower in the fats and sugars that make arabica more flavorful (and popular). Robusta is used in strong Italian espresso blends to give the tiny coffee have a better head, or crema. It’s also used in many instant coffees, as its beans are cheaper to produce. Instant coffee has also been around for quite some time; according to NPR, the U.S. Army distributed this polarizing powder to soldiers in World War I. By the middle of the 20th century, instant coffee made up nearly a quarter of all consumed coffee. Although now the emphasis on coffee is more about taste, less about convenience, you can still find the instant stuff on grocery store shelves. I used to wonder why instant coffee was even still sold, until I bought it post-Hurricane Sandy to make sure I never had to go without coffee again. But in non-emergency context, does it have any culinary value? You may be surprised to discover the cooking and baking projects that can be enhanced by a healthy shot of instant coffee, which adds that all-important coffee flavor without an abundance of liquid. So, what should you actually make with instant coffee? Baking cookies allows for a certain level of creativity, thanks to the forgiving nature of most mix-ins. You can look to instant coffee to provide a depth, nuttiness, and mild bitterness to a cookie, like Martha Stewart’s Espresso Bean Shortbread. You can also use instant coffee to make an even richer tiramisu, which is wholly unnecessary, but extremely delicious. Instead of soaking ladyfingers in plain coffee, mix instant coffee into a mixture of evaporated milk with a dash of sugar. The richness of tiramisu can always get more intense, and the flavor of the soaked cookie portion is crucial to get the creaminess of the mascarpone to sing. When you take one good brownie and savor it, they have a chocolate truffle-like appeal. Other times, these can be the fuel of a munchies rush, where you put away more fudge than you thought possible. Adding a dash of instant coffee will intensify the payoff of dark chocolate like a melty, fudgey version of a chocolate-covered coffee bean. 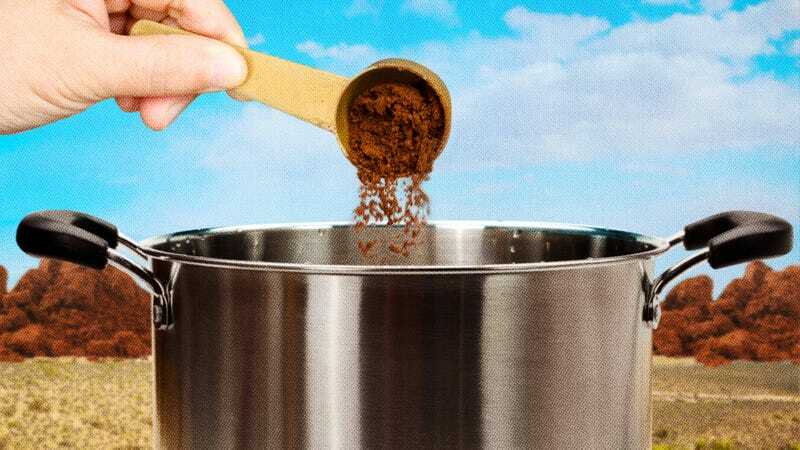 Try this coffee-enhanced version from Lifehacker for built-in munchies. 4/20 is rapidly approaching! Sprinkle little dashes of Cafe Caribe instant coffee onto some super-rich vanilla gelato, and a flavor star is born. The coffee crystals melt right in as you eat it, and this combo tastes like a brilliant affogato. You can also use these crystals to do a flavor change magic trick if you’re bored of vanilla and it’s the only flavor you have on hand. No cooking show goes to the Maghreb without showcasing the beautifully spiced dishes packed with cumin, cinnamon, allspice, clove, turmeric, and sometimes almost a dozen other aromatics. Chicken or lamb that’s being marinated or cooked with this type of potent seasoning is just the right place to add a dash of instant coffee. The aromas of such divine combinations could use the mystery depth of coffee if you want to add a unique touch. TV chef Ainsley Harriott has this beautiful recipe for chickpea and lamb tagine that would be a great home for a little coffee sprinkle. When the revamped Queer Eye set upon a camp counselor who loved to cook on open flames, food expert/avocado fan Antoni Porowski made a coffee-rubbed porchetta that looked divine, served as a slider with a cherry sauce and cilantro red cabbage slaw. Rubbing down a fatty meat like pork with a coffee and spice mixture is a shortcut to savory. Instant coffee would spread and saturate better in a marinade than brewed coffee or ground coffee, and you won’t have to crunch on it after. Coffee is the type of robust flavor that easily slides into a food like barbecue. Some pitmasters will incorporate ground coffee in a dry rub, but an easier foray into the coffee-BBQ world is to use it in a barbecue sauce. This particular recipe for oven baked barbecue chicken suggests using instant coffee. Though you might not want to drink instant coffee unless you were truly desperate, you won’t be disappointed by its cooking-friendly flavor. Instant coffee gets a bad reputation—which I blame on Sanka—but it really can be the difference between having a coffee and going without when the power is down and the stores are closed. It can also add a culinary complexity that’s worth experimenting with, especially given how affordable instant coffee is. Next time you’re playing with strong spices or a milk-fat heavy blank slate, try a sprinkle for yourself. Whatever happened to those fancy Starbucks Reserve stores?